Evgenii Nikanorovich Pavlovsky (1884-1965), photos taken ca. 1960-1965. For biographical info go to http://www.zin.ru/labs/parasites/schoole.htm. The concept of natural nidality was defined by Evgenii Nikanorovich [E.N.] Pavlovsky as part of his dissertation work on spring-summer and autumn encephalitis which took place from 1937 and 1939 . This work reviewed the ecology and transmission of diseases naturally spread between man and animals in certain parts of the Soviet Union. By 1941, Pavlovsky’s work led to the development of new methods for preventing and treating these two forms of encephalitis–spring-summer and autumn. Published just a few months later, his thesis introduced his interpretation of “the theory of nidality” based upon his local experiences. This theory defines how disease is allowed to spread naturally across an environmental setting due to ecological relationships between its causes, the pathogen responsible for it, and any animals responsoible able to carry it or become infected. Due to his accomplishments, Pavlovsky won the State Prize of the First Rank for the discovery in 1939. Four years later, by producing his second work on this topic entitled “Handbook on parasitology of man and theory on vectors of transmissive diseases”, he won his second State Prize of the First Rank for his work in 1949. The results of this work were published in 1946 and as a second edition in 1948. Pavlovsky is best known for his writing entitled (translated as) “Natural focality of transmissive diseases in connection with landscape epidemiology of zooanthroponoses” (Moscow, Leningrad, 1964. 211 pp). For this he won the Lenin Prize of First Rank in 1965. Like his prior writings, this book published in English, and is known by its shorter title “Natural focality of transmissive diseases” published in 1964. This book remains one of the standard texts required for the study of disease ecology and mapping. Pavlovsky and colleagues neverfully received the warm reception they were due from academicians in non-bloc countries due to this success. This is perhaps due to the expansiveness of the country of Russia and the unique ecology it has due to its size and distribution across the earth’s surface. 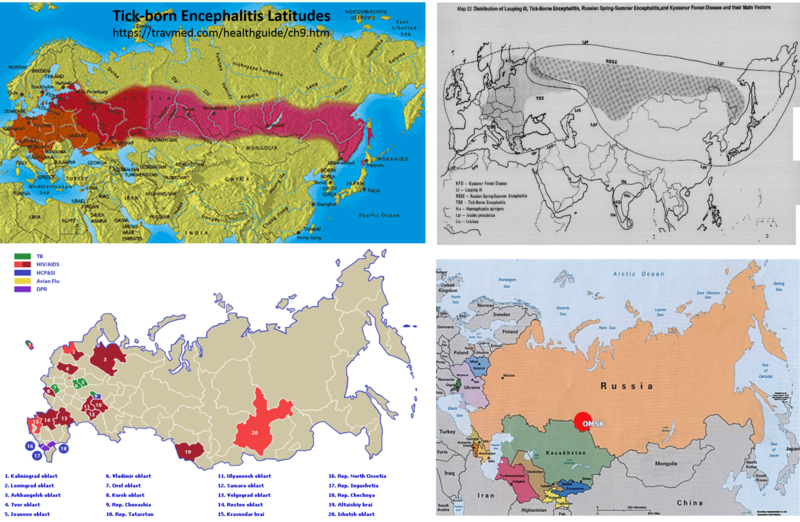 Nevertheless, Russian geography, topography, climate and medical ecology provide us with important insights into the field of medical geography as a whole. Pavlovsky’s work set the stage for the future of this field, and his work defined the science, profession and professional school related to parasitology. Following Pavlovsky’s death in 1965, Russian medical geographers continued to focus on medical geography during a period of time when many of the participants in Western Europe and especially United States medicine steered their interests in other directions. The retention of geography as method for studying disease was more a European tradition than a United States tradition once the bacterial theory for disease was developed, and more an Eastern European than a Western European tradition. It was almost as if we could only focus upon one aspect of disease at a time–the microcosm (bacteriology and such) versus the macrocosm (medical geography as a discipline, not an idea). As they perfected their research of medical geography, Russian geographers had several other areas of geography-related interests they engaged in as well, such as the impacts of macroeconomics on the changes in a country. As they continued to modify and add to their interpretation of central place theory, they further defined the importance of satellite cities in regional development and economy. This led to a macroeconomics geography ideology of place as a region with a population and lifestyle characterized by its primary natural resource industries. One American take on this theory was that there was too much determinism underlying this notion of space and time, leading to further separation of American geographers’ studies from Russian geographers’ studies. 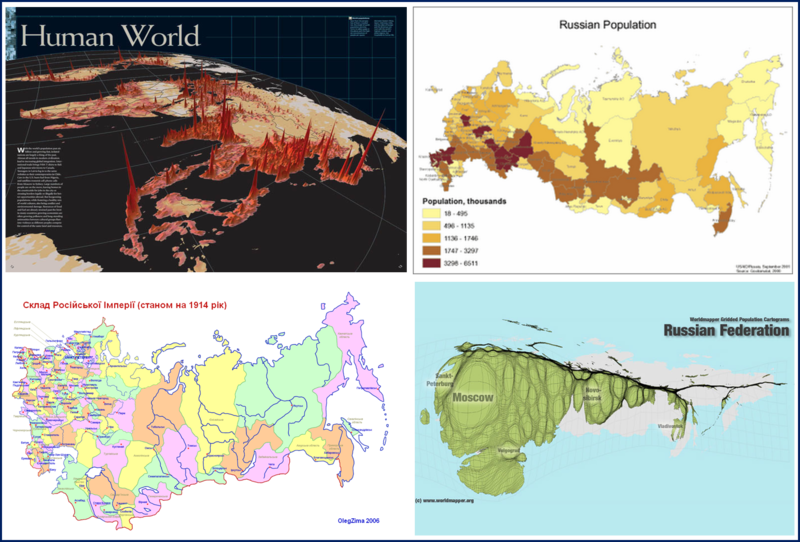 Russian geographers continued to develop their unique view of place and natural resource allocations. This enabled a number of new cities defined by their industries to develop, leading to large urban setting palced adjacent to some of the largest mining industries in the world, and ironically, as well as some of the largest debris and dump sites in the world as well. In a number of these highly specialized industrial city settings, disease management was one of the most important parts of this regional interpretation of land use patterns. 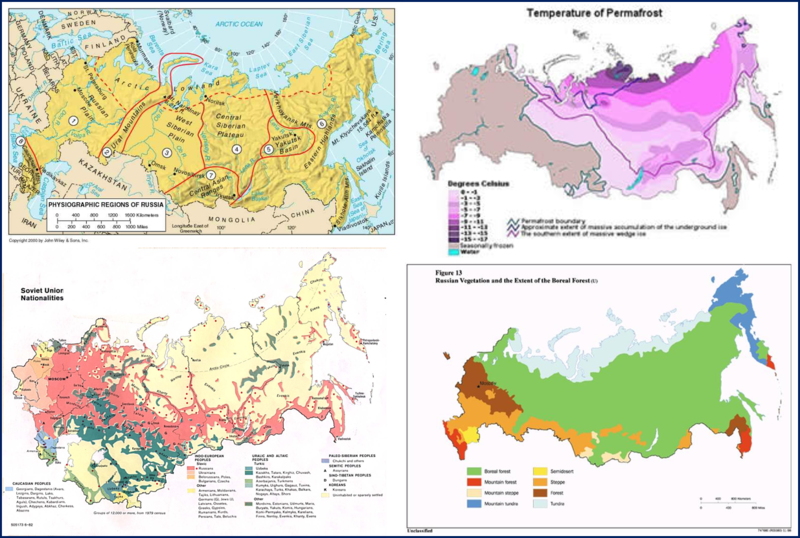 For this reason the Russian geographers have continued to develop their own theories related to diseases common the Russia of a non-zoonotic nature like plant induced poisoning, the effects of soil and geological toxins on life, the topographic relationships of these to tuberculosis, beri beri and goiter. Let’s start with the easiest thing. For instance, people living in the Arctic lose more heat energy than in tropical region. To build-up energy in the harsh Arctic frosts, they need to consume foods which are high in calories. Therefore the diet of Arctic dwellers consists to a great extent of fatty, heavy and copious foods. In tropical regions, where it is warm all year round, people have a diet which is rich in carbohydrates, and poor in animal proteins. They consume a lot of fruits and vegetable, very often opting for vegetarian foods. A large spectrum of other nutrition modes lies between these extreme zones. Thus, geographical zonality influences people’s food preferences, which in their turn account for various ailments, related to vitamin deficiency, various pathologies of digestive organs, and so on. The same principle of geographical zonality is applicable to locally endemic diseases. In dry areas, human diseases are different from those in humid regions due to differences in the fluid balance in their bodies. Local pathologies are determined by vegetable food (take for example the famous Beriberi disease), the surrounding fauna (for instance, tse-tse flies), the chemical composition of water, relief (highlanders rarely become fat, while valley dwellers accumulate fat more often), and so on and so forth. Hence, medical geography is not an artificially created branch of science. It studies existing, objective laws of disease, ailments and pathology distribution around the globe, as well as factors influencing their distribution and an impact they have on peoples’ health. This discipline builds on the study of various natural and social factors, responsible for the course of a disease and its frequency in a particular locality. A key role in geographical distribution of diseases as well as belongs to a number of geographical factors (climate, the composition of water, soil and therefore food, etc.) as well as social ones (living circumstances, level of culture, traditional foods, etc.). Factors taking place in the human body as it ages are equally important. 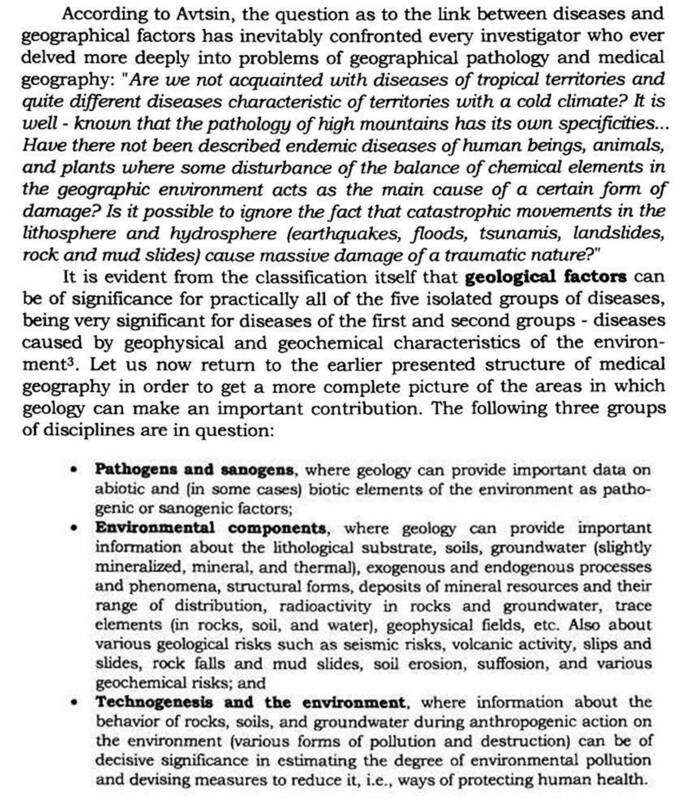 medical geography is closely linked to epidemiology, microbiology, hygiene, pathology, as well as physical and economic geography (in particular, landscape studies). 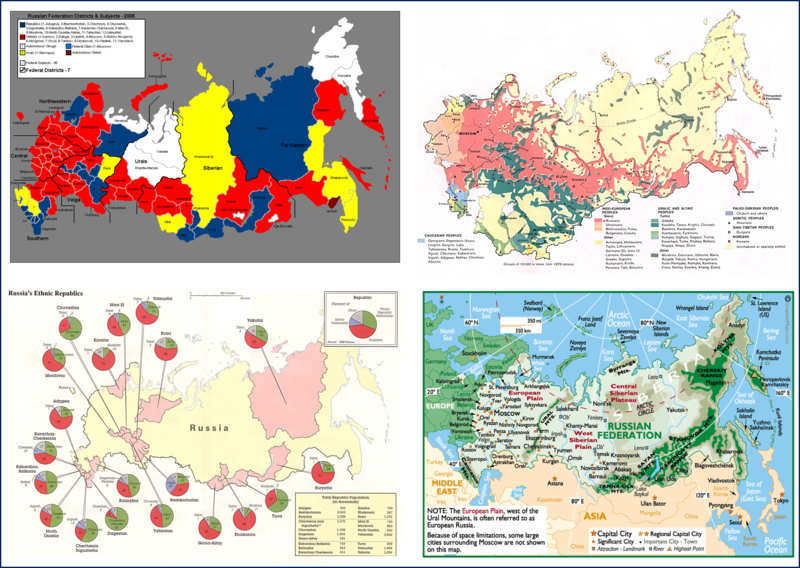 Over the years of reviewing historical medical geography articles and books, I found there to be five very clearly defined periods of Russian dominance and influence upon the medical geography/medical topography profession. Period 1. The Emergence of the Scientific study of Disease and its various Natural History theories, 1790 – 1890. During the later years, this is essentially when Pavlovski meets professor Pasteur. 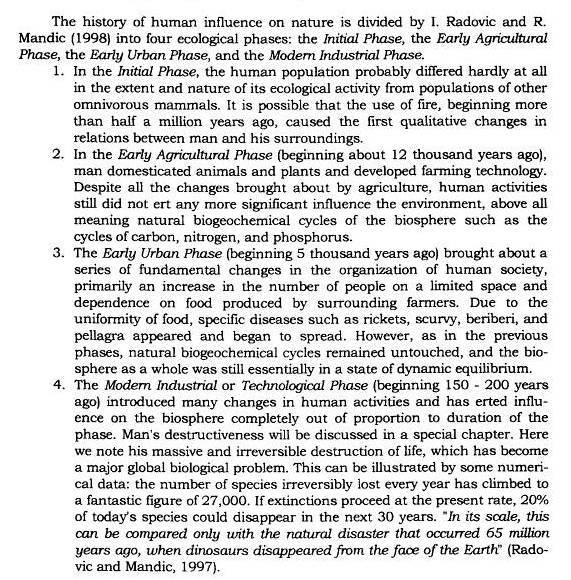 During its first decades, this is when Russian authors write the first and some of the best treaties on the Russian interpretion of health, the environment, and the natural ecology of of disease, esp. from 1840-1855 due to the yellow fever followed by Asiatic cholera epidemics. Period 2. The age of Pavlovskian Influences, ca. 1939/1941 to 1970. Period 3. 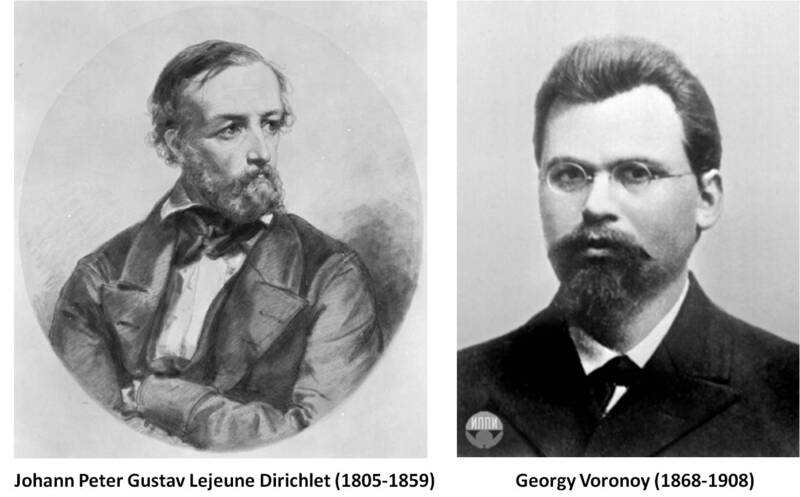 The advancements made by Voronov and other medical geographers following Pavlovsky’s death. Period 4. The Influence of Mikhael Gorbachev’s Russian Democracy on the Sciences and in particular Medical Geography , 1986-1996. The knowledge of disease ecology and parasitology are shared in exquisite detail for the first time between Communist and non-Communist nations and scientists. Period 5. The Influence of 9-11. The the revival of Pavlovski’s natural philosophy of zoonotic disease due to concerns for bioterrorism and agriterrorism. A map of Cholera diffusion by sanitary physician Scouttetten, 1831, of France, depicting the routes travelled by Asiatic cholera, including an unusual route across the Ural Mountains just north of India through Russia, the focus of his dissertation on the same. (This is covered in my historical maps section–an ongoing work in progress.) The cartographer’s other Noms-des-plumes in the medical literature include Scoutetten, Scoutetten le docteur, Henri Scoutetten, Robert Henri Joseph Scouttetten and Robert Joseph Henry Scoutetten. The first period consists of numerous discoveries made by the various nations to better understand disease and the earth as a whole. Healthy and unhealthy places were understood, with the lure of finding the most healthy places in the world on the minds of early explorers. As plans for exploration of new lands continued over the centuries, even more aggressive exploitation plansled to the exploration for the aqua vitae or elixir of life. All economically successful European and Asian countries capable of intercontinental exploration had their definitions of what the perfect, most healthy place would be like. Many times these conclusions were drawn upon similar historical writings like the Book of Moses, but the Garden of Eden concept came to be the most favored theory by the time the 17th century explorations began. This period in medical history and geography also begins with the definition of the inhabitable and uninhabitable regions according the European and Asian folklore and tradition. The largest continent involved in this period of earth’s history, Africa, lacked the traditions or at least the knowledge and awareness needed for any native African philosophies to be fully developed and incorporated with the Eurasian traditions. For this reason, people and physicians viewed the notion of residing in the tropics was potentially deadly, and thus the famous Greek interpretation of this part of the planet as the Torrid Zone ruled in much of the European philosophy and tradition for this time. If it wasn’t for the sangui draconis, mandrake root, upas tree, and their numerous similars in folklore traditions, we could perhaps feel only slightly safer residing in other foreign places, assuming they had that healthy Garden of Eden environment most were in search for philosophically. When the Americas were discovered and added to the story of earth’s surface, the possibility that this region also had many life preserving and prolonging features that had to be explored. As a result, still more geographical locations were defined and considered important regarding the health and well being of a given region. These concepts continued to prevail about the Americas, as much of the east coast was explored by western European countries, and the western shores by Eastern Europeans. It was during the latter half of this period, ca. 1780 to 1850, that the distribution and impact of Russian writings took hold regarding the health of the land, its terrain and water features. The Eastern European writings of the first half of the nineteenth century match the content, quality and historical important of the same items published by the Western European Press. What was lost in the Eastern European press regarding the Russian interpretation of the planet and its resources we gained back slowly over the next century and a half that followed. A review of the Russian literature on these topics in the Index-Catalogue of the Surgeon General’s Office, published from about 1876 to 1903, we find countless numbers of Slavic, Russian and Prussian writings, all pertaining to the same topics and important medical geographies discoveries and summaries being made in foreign Eastern European barely decipherable, barely publishable languages due to their alphabet. The peak years of this period are approximately 1835 to 1855, when Russian Government required its doctors to observe, study and write about their land in order to document the locations of valuable plants, animals, and minerals of importance to manufacturing medicines, as well as the locations of various health mineral water springs, regions prone to particular disease patterns, and topographic and climate setting conducive to good health. These goals were common to medicine throughout the world, and surprisingly, Eastern European geographers at times excelled over the Western European in terms of number and quality of medical geography writings published in numerous Eastern European languages. The 1930s marks the birth of the first steady ongoing research in Russian Parasitology and Zoonotic Ecology, or as many Russian scientists termed it, “Geographical pathology”. This field of study was perhaps first taken to be of minimal. These studies were developed due to the massive size of the Nation and its allies and the range of meteorological, climatic, topographic and vegetation zones that defined the countryside. Russia also some of the largest unexplored woodlands regions, situated in a number of little explored ecological zones. This ecological diversity enabled more large animal-small animal and pathogen interactions to take place a a part of the natural ecology. Due to the lack of many of the seriously pathogenic regions found in Russia throughout the nineteenth century in other parts of the world, a number of the leading capitalist countries paid little heed to understanding Russian science and medicine and the Russian ecological interpretations of disease. As was typical for this time, a sense of competition was in the air during this period of the cold war, accompanied by a very silent intellectual war of sorts bred by Western European and American scientists. The fear of the bomb, the success of the Russia’s first satellite and manned spacecraft kept most Americans away from displaying any interest in Russian success, history and science, not to mention the cursed philosphies of Communism and Leninism. This enabled Pavlovsky and other Russian scientists to perfect their skills in medicine and the natural environment as they learned it. In due time, they took what began as a basic finding involving just one or a few organisms and a single disease and disease region, and applied these to numerous other observations made about the local settings. For Pavlovsky and his immediate followers, this enabled a better ecological understanding of animal bred and propagated diseases. These findings were subsequently published. This era in Russian medical geography history, as told in the American literature, resulted primarily in a solid theory of how animal bred diseases exist ecologically, in association with wild and domestic animals, as well as man. This single notion of nidality created by Pavlovsky remained the most prominent and highly recognized feature of his work by members of the Western European and American medicl professions This notion of nidus wasn’t exactly a new term applied to disease geography behaviors. A doctor in Illinois made use of this same root word in his essay on the complex bahavior of asiatic cholera in western Illinois near Nauvoo and in Warren and Adams County regions in the Summer of 1850, using the term nidus to refer to the birthplace of the local cholera epidemic. This suggests that the broad definition of nidus in environment and medicine was a pretty well understood definition for this term, one which remained in use, but not always common for decades to come. 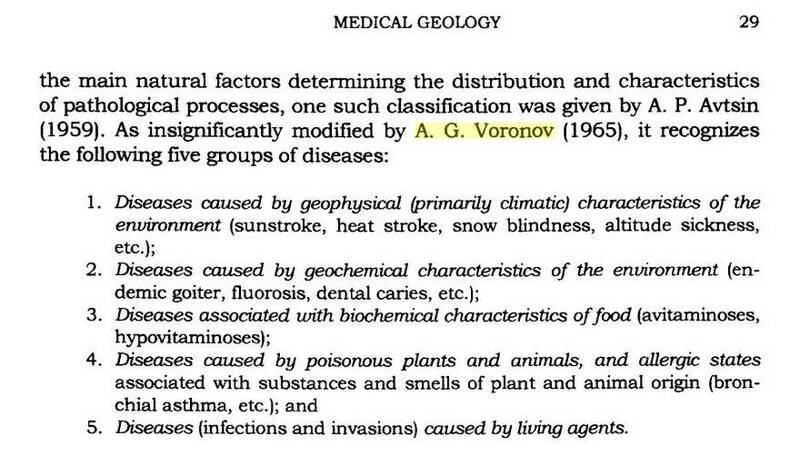 Pavlovsky’s work permanently linked this term to his work on disease geography and geographical pathology, concepts still in use since their publication in the form of a 1968 treatise. During the twenty years following Pavlovsky’s death in 1965, medical geography never diminished in importance in the development of the Soviet Union version of this profession like it did in much of Western Europe and the United States. We were about to enter the darkest years of The Cold War era and overwhelming impact the other countries and countercultures devoted to communism, and its softer more westernized version, socialism, were having on the Western European and United States academic teachings. This period begins with Pavlovsky receiving the Lenin Prize of First Rank in 1965. In 1966, an English version of his book, Natural Nidality of Transmissable Diseases, was translated by Frederick K. Plouse, Center for Zoonoses Research, University of Illinois, edited by Norman D. Levine of the same research institute at the College of Veterinary Medicine and Agricultural Experiment Station (ca. 1964), and published by University of Illinois Press, Urbana, Illinois in 1966. His death soon after had the potential of totally ceasing the growth of the field of science in Russia, were it not for a number of Pavlovsky’s followers and their continued focus on some of the lesser discussed aspects of Russian sciences–the evolution, natural selection and survival of the fittest teachings. Even today, bringing this topic up will probably cause a few eyebrows to raise. In Russian, like in any country, countering the religious culture, which was very strong in certain Russian communities, was the atheist movement in science. The natural philosophy concepts that early 19th century Russians helped give rise to were now having their fullest effect on the people at large. Whereas in American, the study of something like nosogeography was no more, and nosology–the classification of disease patterns–as if they were some sort of evolutionary trait used to define the reasons for our existence, remained very popular in the 1960s and 1970s. For this reason, some of these influences trickle back down into the American sciences as well, such as Takhatjan’s interpretation of plant evolution, and how this can be used to better understand the roles of phenotype and place in regard to plant genetics, phyiology and biology. One of Pavlovski’s followers, Voronov was very much like Takhajan and probably devoted to his teachings. His areas of focus were plant geography and the natural selection process, interpreting the relationship between man and plants in much the same way that Pavlovsky defined the relationships between man, animals and the environment. In his own way, Voronov continued Pavlovsky’s work in parasitology research by develop a very complete and thorough view of the geography of the earth’s surface and disease in relation to human development, cohabitation with the local biological and non-biological components of the earth’s settings and human-animal disease states. Voronov thereby added much to Russian medical geography philosophy by focusing on the chemistry of the earth and its mineral, plants, water, etc., and then integrating more of the botanical information into Pavlovsky’s natural nidality model. When communism and Leninism fell in USSR during the mid-1980s, it was under Mikhael Gorbachev’s “watch” and command. This unexpectedly led to the opening of doors to the numerous Russian universities in 1989 as a result of his Perestroika and Glasnost programs for political change. Setting aside for a moment the problems with seriously outdated educational settings at times, this experience enabled western Europeans and American scholars to obtain some very important insights into Russian medicine and Russian philosophy regarding health, the environment and disease. For a short while, this allowed American scholars versed in Russian to translate many of the scientific findings in the numerous journals then published. Many of these discoveries made by Russian scientists and engineers were little known until the door to academia was finally opened. Prior to this time, very few of these Russian studies were referred to at all by American scientists and scholars. An important part of the translation of Russian Science journals was the development of a monthly journal devoted to publishing various summaries of these translations. These articles were much like the old fashioned book reviews of the 19th century, containing significant amounts of information on the topics under discussion, along with reviews made by the writer about the important value of this new knowledge. It was here that the next generation of Pavlovskians published their philosophies on geographic pathology and animal disease. Due to these journals we learn more about the teachings of Pavlovski and the additional accomplishment of his followers like biologist Voronov. Soon after biologist and ecologist Voronov teamed up with Pavlovski’s followers came the metaxenotics concepts of disease as defined in detail the macroecology of animal bred diseases capable of impacting humans. With these articles, we see some of the best examples of how different spheres of influence exist in nature, and how whenever and whereever these spheres overlap, new events can take previously lacking from the local natural history. In Russian medical and natural philosophical terms, this is how and why new diseases are born and old diseases allowed to spread. Even though the diseases referred to by this theory were very much Russian-derived and rarely American in nature, the geographical teachings and concepts shared about their behaviors and spatial analysis were important lessons highly applicable to United States and American zoonotic disease geography and ecology. This release of so much information during Gorbachev’s reign set the stage for later work that made better more modern use of these basic Russian Geography teachings. American scientists in essence needed this break in the competition to catch up with the other scholars. Modern Industrial = beginning 150-200 years ago. This resembles more closely the modern teachings for the history of mankind studies. Most important however is the authors’ interpretation of how these time frames relate to diseases. The fifth period in the Russian influence upon American geography came as a result of the immediate post-9-11 period. This period of post-Pavlovskian (not Pavlovian) influence played an important role in the most recent changes in medical geography thinking that have taken place in American medical geography history and “geographic pathology” teachings (as well as global medical geography concepts history). Universities like Purdue and Cornell, with their exceptionally large agricultural and livestock research institutions, were able to blend the needs for protection of the American foods industries with the bioterrorism problems that erupts in the 1990s and 200os. It is due to this blending of seeming unrelated sciences and professions that we now have the anti-agriterrorism, the major scientists of which have taken on still more of Pavlovski’s teachings about zoonotic diseases. This increase in sensitivity to the need for more active watchdog programs designed to uncover new diseases, before they spread too far, was assisted by the documentation of such diseases as the animal-human bred and born diseases like rat-bred hanta virus, the elk-bred prion-induced “mad cow” disease, and the foreign monkey bred ebola. Pavlovsky states that naturally-defined disease niduses require inhabitation by warm-blooded vertebrates susceptible to them and their disease. This natural ecological setting meets the biological requirements of the pathogens, vectors and carriers. In some cases, these regions can overlap with people, in which case a focus for the disease is developed (foci~plural). Each focus requires a number of environmental factors for the disease to result in infection. People contract the disease by passing through the area considered to be the nidus. For example, in nature, an inhabited rodent burrow may become important to defining a nidus, or a particular streambed frequented by wildlife, or a grove of plants or trees of a particular species. In order for the illness they carry to become a human disease, potential human victims must pass through or encroach upon the same natural setting. In this fashion, the zoonotic disease born by animals is defined along with an anthroponotic region whereman can become infected. These two regions don’t have to overlap perfectly with each other, and along with the distribution of the pathogenic organism form a metaxenosis–the region where the environmental and pathogenic requirements for a disease exist. The nidus or nest is the place where the right combination of requirements exist in order to disease to occur. As demonstrated by his dissertation, Pavlovsky showed that a direct relationship between man in the environment is not necessary for diseases to erupt and become anthroponotic in nature. Intermediate forms of the potentially pathogenic regions exist, enabling the disease to cross certain physical barriers to its migration, thereby resulting in new epidemics. Such places exist only due to vectors, such as mosquitoes, mites or lice, which are allowed to migrate from their natural settings into some human ecological setting or environments. In recent years, this has become one of the most important ways to study disease phenomena in the United States. We typically utilize Pavlovsky’s teachings to develop a much deeper understanding of diseases outside of the typical textbook and lab setting. Spatial epidemiology and the use of computer generated mapping or analysis of these disease ecology settings allows us to document and study disease phenomena more effectively and more spontaneously than ever before. We traditionally interpreted livestock disease monitoring as a public health speciality separate from people health. The links between animal disease and human disease seemed occasional and few and far between for the most part. Livestock served as sentries for us when it came to analyzing the flow patterns and distributions for certain disease types, such as the use of the songbird to indicate when a mine was about to lose valuable oxygen stores due to a methane leak, or when local poultry sentries are dying due to avian flu or some tick-borne viral disease. When it comes to disease studies and research, the tendency is for most of us to focus on people and populations. This means that the surveillance of just crops and livestock is an application of GIS rarely discussed or barely covered in most standard GIS classes on health, and little time is spent contemplating the relationships that exist between us, domestic animals, wildlife, crop fields, and fodder storage when it comes to evaluating disease and the environment. It is only those occasional giardia cases we experience as campers and hikers, or the local elk epidemics due prions related to “mad cow” disease that most remind us that disease is a consequence of the natural environment . This means that the study of disease and disease ecology is as much a study of zoonoses and it is a study of anthroponoses. Pavlovky’s approach to studying and understanding disease organism ecology focuses on the biological requirements of the organism, not its disease, over time and space. This change in emphasis to the biological nature of the pathogen makes this kind of study of disease more an ecological study, and less a study on just people. Pavlovsky’s work gave rise to the term “geography of pathology”, a study of plants, animal and the environment first when it comes to disease, and people second. In the Russian interpretations of medical geography, parasitology medical geography specialists E.N.Pavlovsky and D. K. Zabolotny applied these concepts to numerous other diseases. Before the causes for cancer were known. 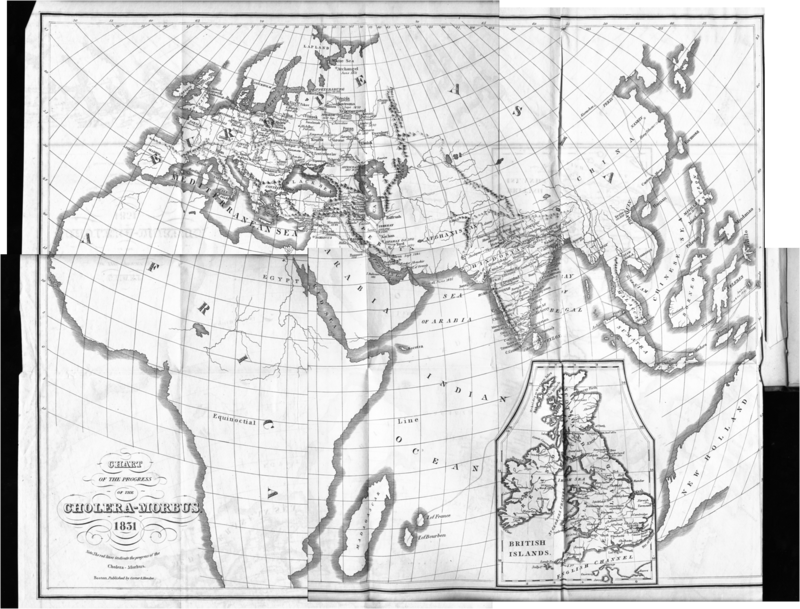 British geographers had their own interpretations of cancer and geography during this time as well. The most important example of such writings is perhaps that of Alfred Haviland in 1875. [Related Google Book Link] It would take another 5o years of more for physicians and pathologists to learn anough about cancer to realize it did not have just one cause, and that the cures that could be produced were going to have to be quite numerous, as many cures as there are different types of cancer. Likewise, this also meant that any mapping of cancer was going to provide just one viewpoint of the regional interpretations of cancer and cancer deaths. The presence of parasites know to cause cancer in sheep, pigs and cattle, cabbage farms next door, or corn mills and ergot-enriched grain supplies, industries responsible for large amounts of fuel emissions, volatile gases or metal fumes, the proximity of specific regions to power stations, mines, heavily travelled highways, highly contaminated watersheds and water bodies were also not the cause for cancer. Poverty, lack of sufficient cancer screenings, poor nutrition, unsanitary living conditions, were as much responsible for cancer as were those single causes most people try to lay blame upon. The general lesson we learned by mapping cancers and diseases was when and where correlations can exist, and where they most likely do not exist. 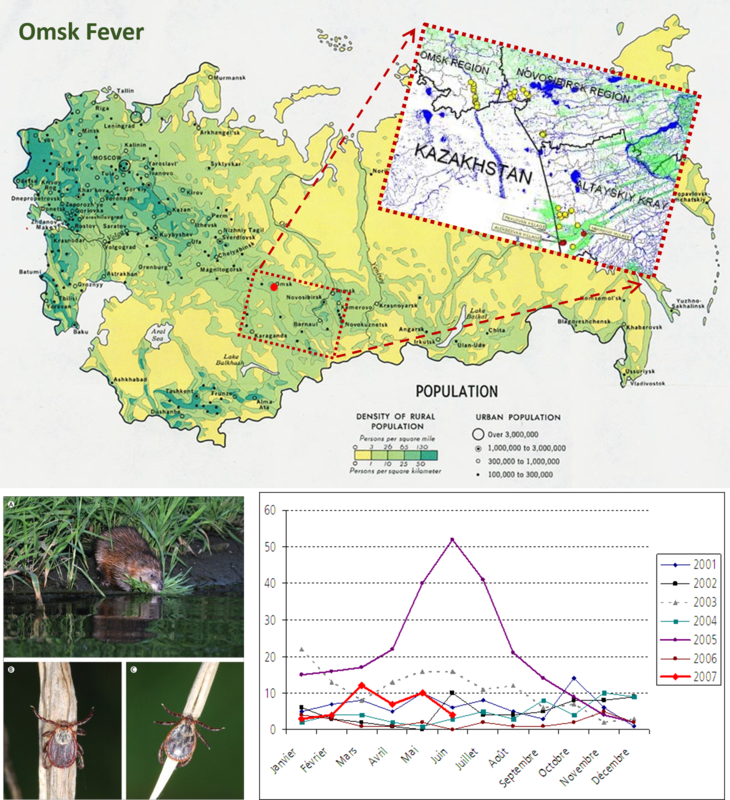 The Russian ecology derived Louse- and Tick-born forms of diseases like typhus and encephalitis remain some of the best examples of disease mapping research that demonstrate the value of medical ecology (both social and natural ecology) and medical cartography in our attempts to learn more about given disease pattern using spatial epidemiological tools. A study of the ecology of these diseases resulted in one of the first detailed reviews of natural disease ecology. Years later, in 1965, it was followed by his culminating work on zoonotic diseases and parasitology with the title Natural Focality of Transmissive Diseases. In his book on natural focality, Pavlovsky summarized his interpretation for the first time of the term nidality or “nest”. A disease nidus is a place where a disease originates. In Pavlovsky’s work, natural nidality refers to the environmental relationship that exists between the disease, organisms, the environment and man. His model for better understanding disease spatially includes a central point or locus for an infection, surrounded by the natural nidus or nest of a disease, and then several much larger areas used to define the areas inhabited or travelled in by the disease vectors, carriers,victims and in some cases people. Close to the nidus, there is a central zone where the disease is almost always present. Surrounding this area are the metazones or metaxenotic regions. Metaxenosis refers to larger areas travelled by one or all of the other organisms somehow related to the disease source. Pavlovsky used this model to define how the disease evolves and migrates into nearby regions that were previously uninfected. He applied this to numerous domestic and wildlife impacting zoonotic diseases, applying parts of this disease ecology to explaining how human cases develop or evolve. The following, pulled from wikipedia and moderately edited, demonstrates this aspect of medical history and historiography common to American and Western European epidemiologists. The original Wikipedia version of what follows details the nature and history of tick-born encephalitis (TBE) but fails to mention its discovery by Pavlovsky. TBE is caused by tick-borne encephalitis. Russia and Europe report about 5,000-7,000 human cases annually. Long-lasting or permanent neuropsychiatric sequelae occur in 10-20% of infected patients. TBE is a virally-induced infectious disease of the central nervous system which typically manifests as meningitis, encephalitis, or meningoencephalitis. Several species of infected ticks help to transmit this disease, such as Ixodes scapularis, Ixodes ricinus and Ixodes persulcatus. On rare occasions it can be transmitted through the non-pasteurized milk of infected cows. The virus responsible for this disease is of the genus Flavivirus [Family Flaviviridae], first isolated in 1937 through the efforts of Soviet Epidemiologist and Parasitologist Evgenii M. Pavklovsky. Pavlovsky’s work helped to differentiate two of the three seasonally different endemics known to exist due to this “pathos-geography or pathology geography” (from the Russian terms used by Pavlovsky and his associated). The two forms of TBE that prevail in the USSR are the Siberian tick-borne encephalitis virus,which infects people in autumn, and the Far-Eastern tick-borne encephalitis virus, also known as the Russian spring summer encephalitis virus. The most recent virus linked to TBE outside of Russia is the European or Western tick-borne encephalitis virus. Oleksandr Oleksandrovich Bogomoletz or Bogomolets (1881-1946). Carleton J. Phillips, Anne M. Harrington, Terry L. Yates, Gary L. Simpson, and Robert J. Baker. Global Disease Surveillance, Emergent Disease Preparedness, and National Security. Museum of Texas Tech University Lubbock, Texas. 2009. Access at http://muconf.missouri.edu/odni/DiseaseSurveillance.pdf. Agroterrorism: Minimizing the Consequences of Intentionally Introduced Foreign Animal Disease . A Monograph by Major James P. Dykes . . . School of Advanced Military Studies United States Army Command and General Staff College, Fort Leavenworth, Kansas AY 2010. Accessed in pdf form at http://www.dtic.mil/cgi-bin/GetTRDoc?AD=ADA522943. For more on Theissen or Voronoi Polygons, see http://qmrg.org.uk/files/2008/11/45-voronoi-polygons.pdf, as well as http://en.wikipedia.org/wiki/Alfred_H._Thiessen. Earlier renderings of similar spatial shape analytic tools relate to work on Lejeune Dirichlet’s Tessellation (1850, reviewed quite nicely at http://www.passagesoftware.net/webhelp/Delaunay_Dirichlet_Tessellation.htm ) and the Voronoi Diagram (1908, for basics go to http://en.wikipedia.org/wiki/Voronoi_diagram].